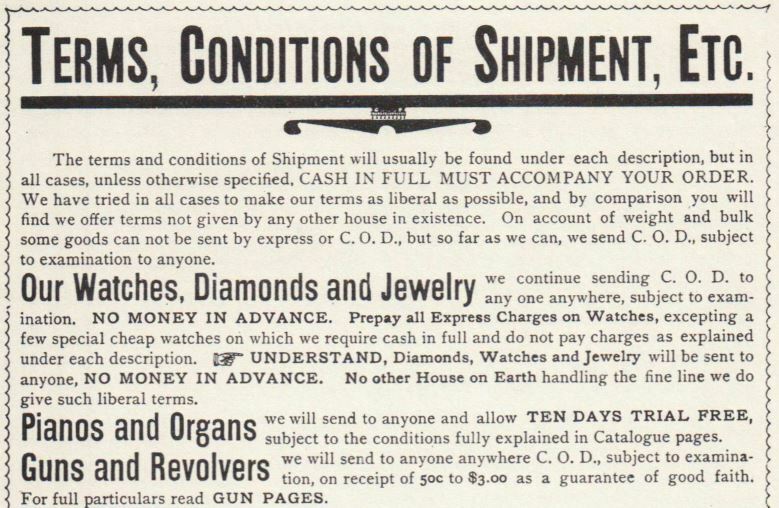 In my previous article, Paper: Common in the Old West?, I shared newspaper advertisements from the Old West era and listings in two Montgomery Ward & Co. Catalogues (No. 13  and No. 57 ). I couldn’t help my curiosity about how a person went about ordering something from Montgomery Ward or Sears, Roebuck & Co., Bloomingdales, or the like… and decided to do a little digging. I own paperback unabridged facsimiles of the two aforementioned Montgomery Wards & Co. catalogues (their choice of spelling), and the Sears, Roebuck & Co. Consumer’s Guide for 1894. I’ve also purchased the Bloomingdale’s Illustrated 1886 Catalog (their choice of spelling). Aaron Montgomery Ward started the first giant mail-order enterprise in Chicago just after the great fire of 1871— in 1872. The Transcontinental Railway completed in 1869, so Ward was well-positioned to reach remote areas in the west as well as working families throughout the longer settled regions. Chicago is well-situated to address business throughout the continental United States. Sears, Roebuck & Co. Consumer’s Guide 1894, pg 3: take pride in selling goods “Almost Everywhere!” Every city, every town, every hamlet in every state…and nearly every country on the globe. Our business was organized in 1872 to meet the wants of the Patrons of Husbandry, from whom we then received our main support. We did not, however, refuse the patronage of any person, knowing that the more good we handled the cheaper we could sell them. Both companies took pride in selling directly to the consumer at prices well below those available at the country market (general mercantile). Shop owners bought in much lower quantities than the giant mail-order companies and needed to make a profit. Montgomery Ward & Co. went so far as to encourage relatively small groups of neighbors to band together, make group purchases called Club Orders, and split the discount awarded for paying in cash. I find it interesting that most catalog companies instructed purchasers to simply send a letter with a distinct list of information: name, basic address, method of shipment (more later on), precise items requested, and total amount of money enclosed. Bloomingdale’s catalog gives nearly identical instructions as those pictured below (Sears). 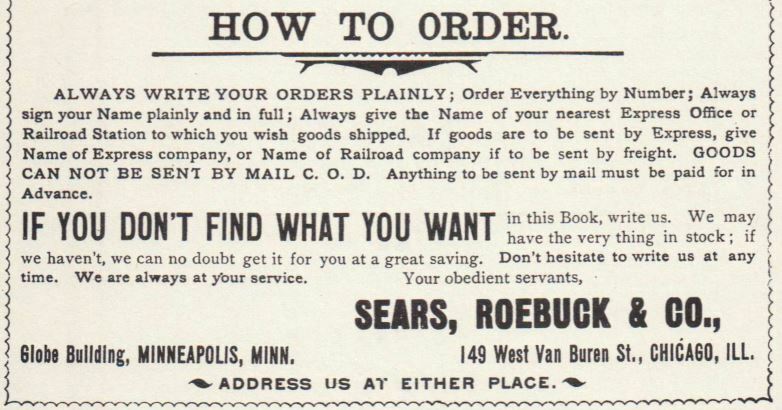 How to Order: Sears, Roebuck & Co., 1894, pg 4. Note the Montgomery Ward order slip sample (that could just as easily be replicated in a person’s correspondence simply by providing the information as outlined)–center, right-hand side. 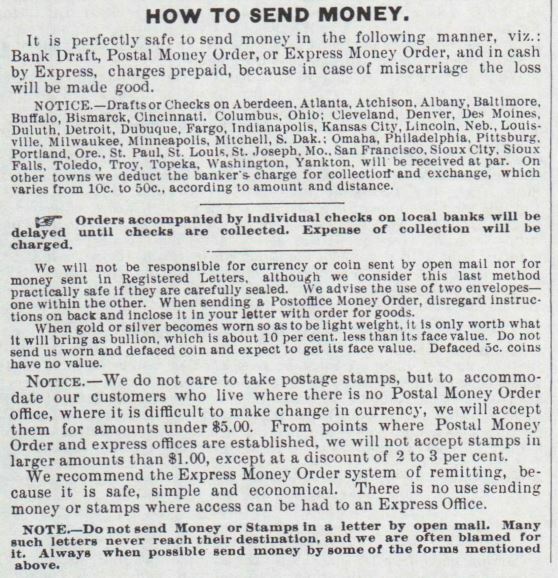 “State here the amount of money sent and whether Draft, Express Money Order, Postal Order, Postal Note, Currency, or Stamps. Mail (United States Postal Service). Postage cost 1¢ per ounce (16¢ per pound) and was limited to 4 lbs. maximum per package (though an unlimited quantity of 4 lb. parcels may be delivered to any one address). Cash payments required in full prior to shipment, to cover goods and postage. Express Service (Agents at the Rail Depot) — made allowances for C.O.D. and the ability to examine the product prior to paying for it. Payment could be made directly to the agent. This necessitated the purchaser live in or near the railway town with easy access to the express office. Express orders should exceed $5. Railway Freight (if more than 100 lbs. in weight). This would work ideally for a “club” order (group of neighbors placing an order together), or when ordering a piano or other large object. Richard Sears recognized customers of the day felt it was risky to order and pay for merchandise before it had been examined [preface of Sears, Roebuck & Co. 1894]. As an insurance of the company’s integrity, Sears established the now-famous policy of “Satisfaction Guaranteed or Your Money Back”. Sears excelled in this arena by offering C.O.D., subject to examination, with minimal money sent in as a guarantee of good faith. One more interesting historical tidbit. Browsing through these catalogues, the old prices seem ridiculously low (even with inflation). One and two dollars for “earnest money” seems too low to be meaningful. Amateur historians may find this Inflation Calculator immensely helpful. To put the $2.00 (in 1894 [Sears’s Catalogue year]) in earnest money to examine a baby carriage = $55.56 in 2015 (this particular online calculator doesn’t offer 2016 as an option). BTW, baby carriages ranged in price from $2.68 [$74.44] to $23.60 [$655.56] (about 16 options). Baby buggies were apparently not for the poor. 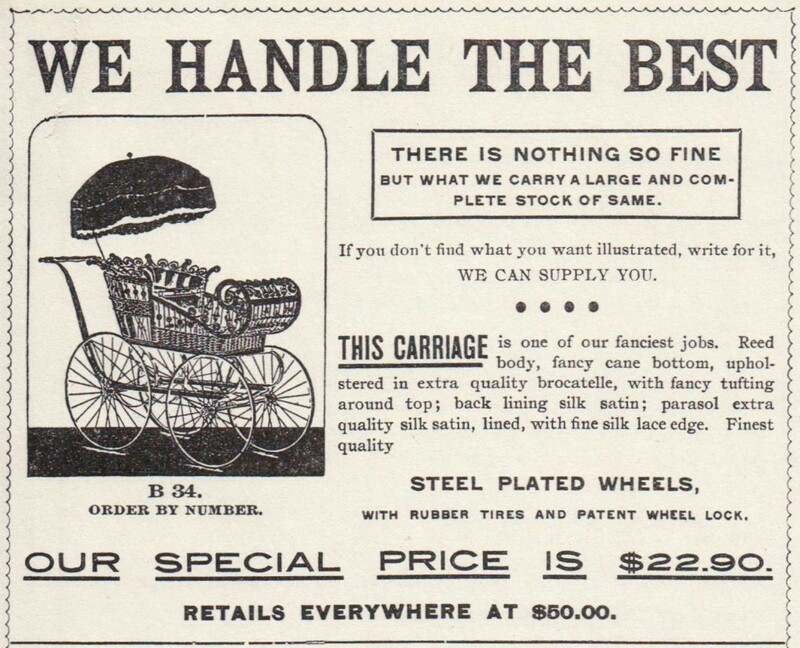 Baby Carriage (one of approximately 16) offered in Sears, Roebuck & Co. Consumer’s Guide for 1894, p. 193. Adjusting for inflation, this “special” price of $22.90 is equivalent to $636.11 in the year 2015. Please forward this article to someone you think would enjoy it! See the “envelope” icon on the social sharing panel at the top and bottom of this article page. Comments? I’d love to hear what you think of the subject of mail-order companies in the 19th Century American West. 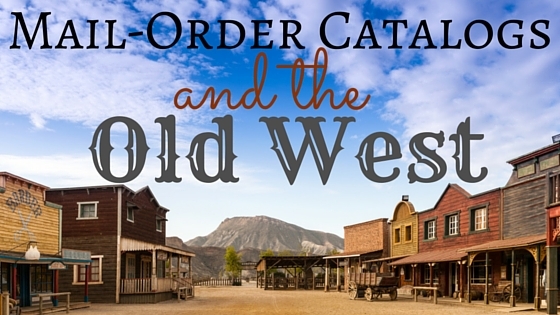 Up next: Mail-order catalogs didn’t show up in America as early as you might think… and couldn’t have impacted the mail-order bride phenomenon as early as today’s popular fiction market makes it seem. Stay tuned for my upcoming article Mail-Order Catalogs: Timeline and Truth. 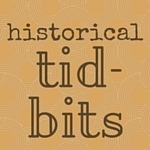 After all, fans of the mail-order bridge niche will find these historical tidbits fascinating!